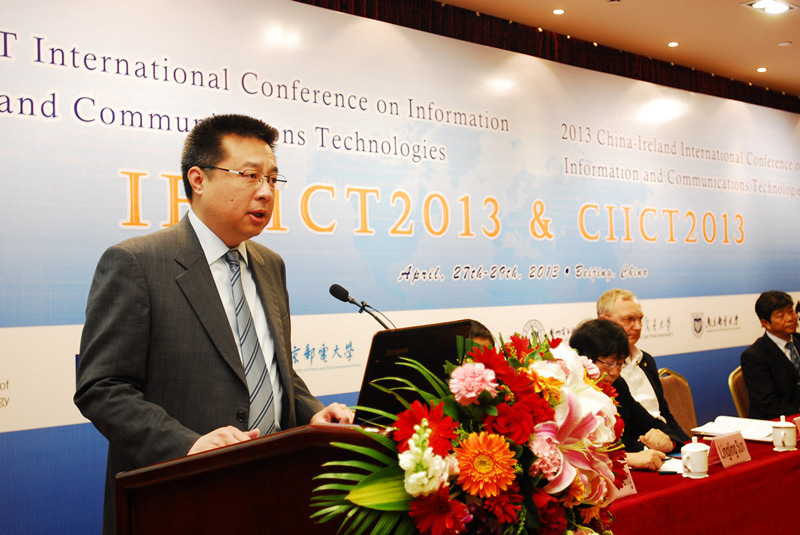 The 2013 IET International Conference on Information and Communications Technologies (IETICT 2013) was held in Beijing on April 27th, 2013. It was hosted by China Institute of Communications (CIC) and Institution of Engineering and Technology (IET), and organized by the Youth Working Committee of CIC, Beijing University of Posts and Telecommunications (BUPT) and Dublin City University (DCU). 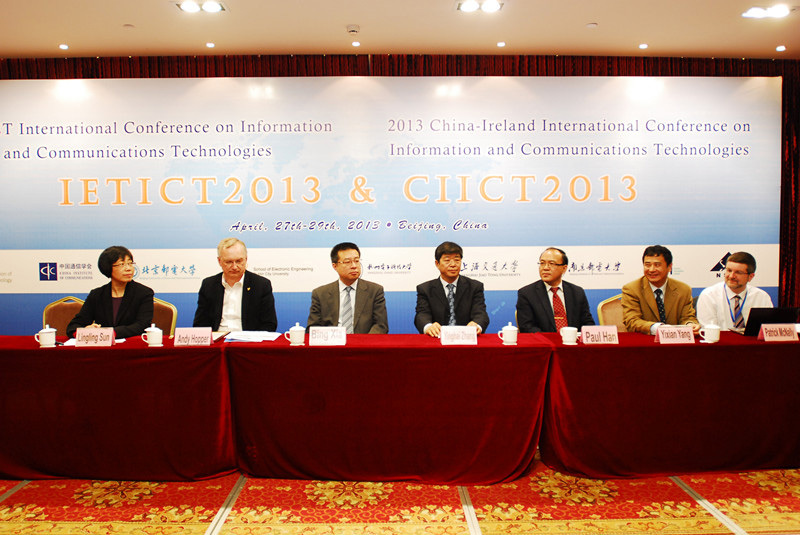 Also, the 2013 China-Ireland International Conference on Information and Communications Technologies (CIICT 2013) was run over the same period. The opening ceremony was held at BUPT High-Tech Mansion at 10 o’clock of 28th. Distinguished guests attended the ceremony included the chairperson of IET, Prof. Andy Hooper from the Department of Computer Science of Cambridge University; the director of the Dept. of Cultural and Educational Experts of the State Administration of Foreign Experts Affairs, Mr. Xia Bing; the director of the Academic Committee of BUPT and the deputy secretary general of CIC, Prof. Zhang Yinghai; the vice-president of Hangzhou Electronic Science and Technology University, Prof. Sun Lingling; the business director of China region of IET, Mr. Paul Han; the deputy director of the Academic Committee of BUPT and the CIC, Prof. Yang Yixian from BUPT; the division chief of the Dept. of Cultural and Educational Experts of the State Administration of Foreign Experts Affairs, Ms. Li Li; and the chief of International Cooperation and Exchanges of BUPT, Ms. Ren Chunxia. 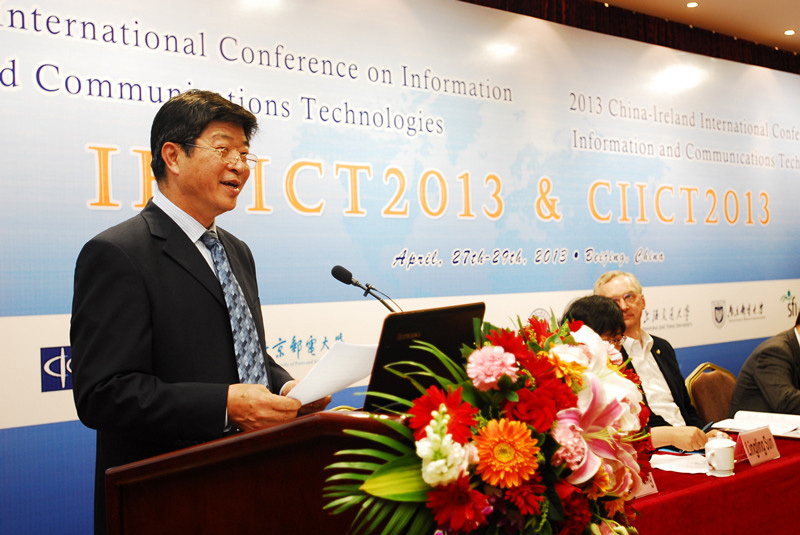 The ceremony was hosted by Prof. Wang Xiaojun from Dublin City University. 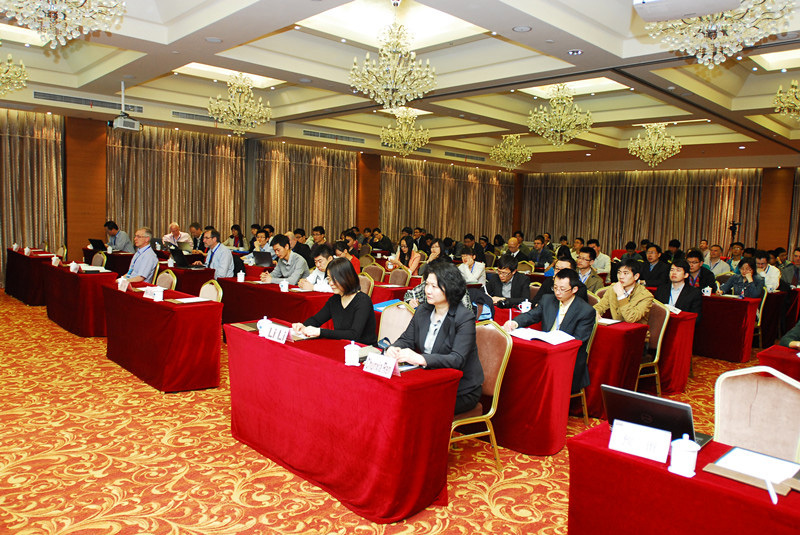 More than 120 experts and scholars from the USA, the UK, Germany, Russia, Ireland, South Korea, Singapore and Taiwan Region attended the conference. Prof. Zhang Yinghai and Director Xia Bing first addressed the opening speech, extending a warm welcome to the experts and scholars from all over the world. Prof. Patrick McNally, the dean of the Dept. of Electronic Engineering of DCU, then read the address from Gary Fallon, the Commercial Counselor of the Irish Embassy in China. In his address, he reviewed the cooperation model and development history in the field of education and research between China and Ireland, and looked into the future of the industry, tourism and enterprise collaborations between two countries. The vice-president of Hangzhou Electronic Science and Technology University, Prof. Sun Lingling specially welcomed the experts overseas. After that, the Business Director of China region of IET, Mr. Paul Han introduced the IET to the audience, emphasizing the current situation of IET in China and the latest 3-year developing plan. In the end, the chairperson of IET, Prof. Andy Hooper awarded certificate to Wang Pin, the vice-chairperson of the BUPT Student Division of IET.  Prof. Reinhard Schaler’s “The Localization Research Centre-Localization research, education, publishing and networking since 1995” from the University of Limerick, Ireland. The prize-awarding ceremony for excellent papers was held on the morning of 28th. The three “the Best Paper” prizes went to the papers from DCU, the University of Science and Technology Beijing (USTB) and the National Taiwan University of Science and Technology (NTUST). 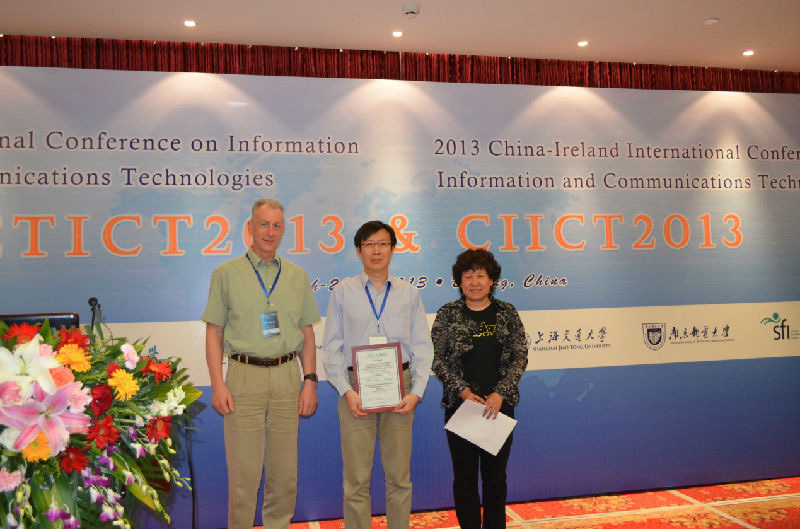 Prof. Song Mei, the co-chairperson of the Program Committee of IETICT 2013 from BUPT, and Prof. John Ringwood from National University of Ireland Maynooth awarded certificate to the authors. The conference received 406 papers from over 40 countries and regions worldwide, with 106 of them finally being admitted. This conference has been made a great success with the concerted efforts and supports from universities abroad such as Cambridge University, Dublin City University, Queen's University Belfast, UK, RWTH Aachen University, Germany, National University of Ireland Maynooth, and Dublin Institute of Technology; domestic organizations such as the National Natural Science Foundation Committee, Hangzhou Electronic Science and Technology University and Nanjing University of Posts and Telecommunications; and the experts and scholars from domestic and abroad. The Director of the Dept. of Cultural and Educational Experts of the State Administration of Foreign Experts Affairs, Mr. Xia Bing addressed the welcome speech. The director of the Academic Committee of BUPT and the deputy secretary general of CIC, Prof. Zhang Yinghai addressed the welcome speech. Distinguished guests present the conference. Participants were listening to speeches. 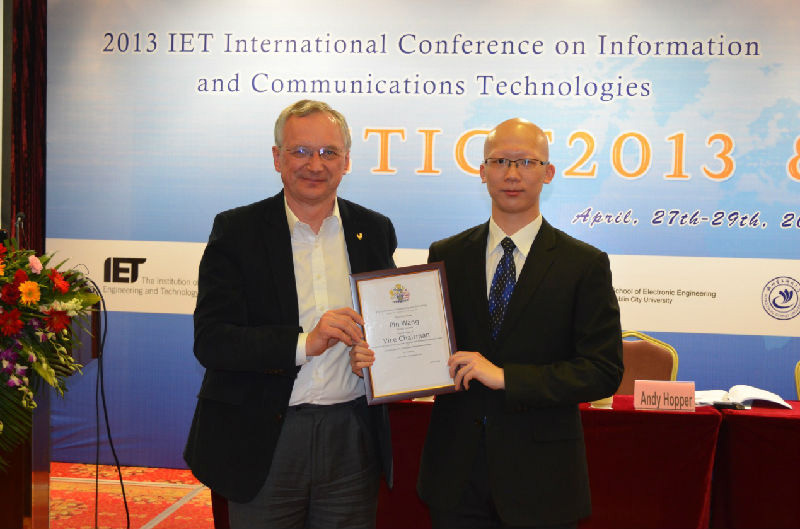 Prof. Andy Hooper awarded certificate to Wang Pin, the vice-chairperson of the BUPT Student Division of IET. The prize-awarding ceremony for excellent papers. The vice-president of BUPT, Mr. Guo Jun met Director Xia Bing,the director of the Dept. of Cultural and Educational Experts of the State Administration of Foreign Experts Affairs. All participants took group photos.